Finally got some time (and patience) to try out one of the first electronic components I bought. The SparkFun PIR Motion Sensor. 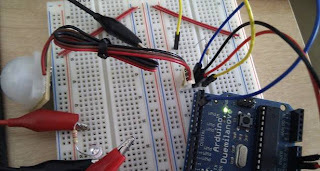 It's use on Arduino is quite simple. When a motion is detected the black (the GND wire is brown on this sensor!) wire carries a LOW state. Providing 5V from the Arduino to the PIR might make it unstable, as the board has a 5V regulator in it. So it is better to connect it to a 12V power source. The signal will come out with a 5V limit, so you don't need to worry about ruining your Arduino. Anyhow, you'll see it being used in a personal project very soon (I hope)!